Welcome To Ab Fab Cleaning: The cleaners that care! After the builders have been in it is very important to get the cleaners in for the finishing touches to your new beutiful home. No one wants to come home to all that building dust! We can provide fully trained staff with plenty of experience to add those all important finishing touches for you. Call us now and get your quote booked in, or follow the link below to find out more! Every rented property needs to be cleaned at the end of your tenancy to get it back to inventry standard. 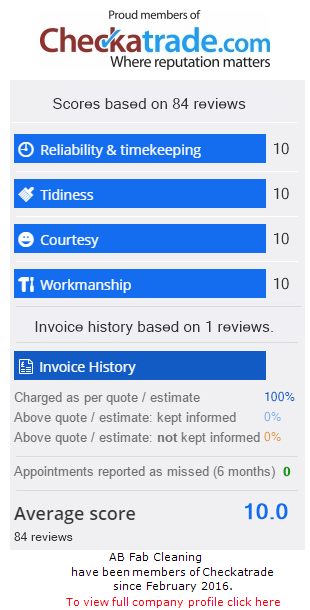 (how it was when you arrived) we have years of experiance in cleaning at inventry standard and have designed a checklist to go by to make sure nothing gets missed out! we also offer a free call back, as long as the property has its checkout within 3 days! call or emiail for your free qoute now! Regular cleans are the most popular. This allows you to spend your free time doing what you would like to rather than spending that time doing all the houshold chores, and still have a fresh clean and tidy home. We can provide you with regular, friendly and trustworthy staff. Leaving you with that professional touch time after time! Call us and get your quote now, or follow the link below to find out more! A spring clean is the best way to get any home into perfect condition and quickly! Let us put an absolutely fabulous spring back into your environment. Call us for a quote now or follow the link bellow to find out more!